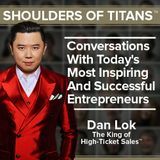 Imagine standing on the shoulders of the titans of entrepreneurship – some of world’’s most successful and influential individuals – and be able to listen in on their content-rich conversations. A few minutes or a hours with these titans – in the flesh – will completely alter the course of your business, your career, your life! The single-smartest investment YOU can make, TODAY, in creating explosive growth in your business… Is getting up close and personal with Titans who have “been there, ... See More done that”… Even if it‘s simply hearing them speak in person standing up and asking the ONE question that will give you the breakthrough you’ve been chasing. Knowing that just one good idea – an offhand remark, a quip, a story of a seemingly-unrelated success – could be worth millions, if applied. Being able to have INSTANT access to first-hand shared experience, knowledge and wisdom from those who literally rank as the world‘s giants in top entrepreneurialism and business expertise. We created this podcast because entrepreneurship is a very lonely path, but it doesn’t have to be! We recruit highly successful renowned entrepreneurs who have done amazing things and allow them to give back by sharing their stories, insight and lessons with you, but also motivating you to continue on your path and journey even when things get tough. This special podcast truly offers you access to some of the best minds in business. A smart entrepreneur learns from his mistakes. A smarter one learns from others’ mistakes. But the smartest person of all learns from other’s successes.